Smart grids are complex socio-technical systems that provide solutions to issues of aging grid infrastructure, increasing need of demand response and aid in the reduction of carbon emissions. Different component technologies, customer behavior and controls in power networks interact in a highly dynamic manner in today’s smart grids . Yet most research on smart grids tend to be domain specific in their simulation and assumptions; thereby being only partly successful in analyzing the complexity of the active grid. A perspective on analyzing socio-technical systems was proposed by Ostrom  which states that “Considerable theoretical and empirical research suggests that adaptive management of socio-technical systems require networks that combine dense local information flows with effective connections across groups and scales to foster the combination of local knowledge, cross scale coordination, and social learning.” This lends a view that complex socio-technical systems should be considered as multi-layered dynamical systems that comprise intra- and inter-layer interactions of very diverse components with local sub-objectives. This view can be applied to smart grids through the Smart Grid Architecture Model (SGAM) . SGAM with different interoperability layers, domains and zones. Technological advancements in the field of ICT, power electronics and hard-ware in the loop simulations, enable the behavior of individual subsystems together with their interactions with each other to be captured and analyzed through sophisticated simulation platforms. 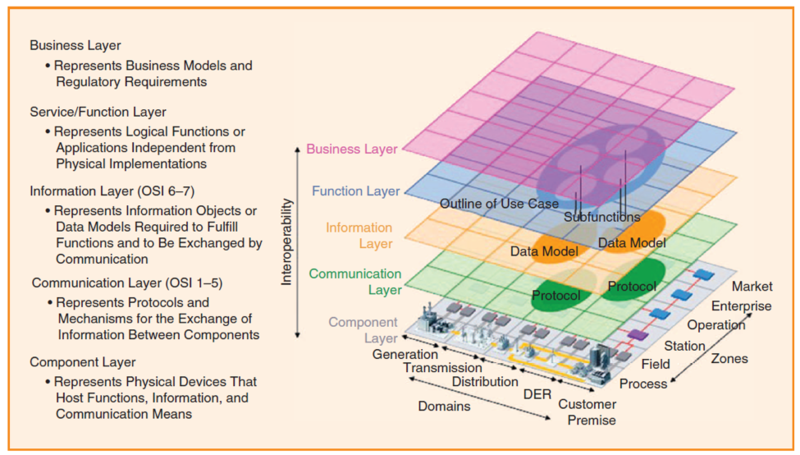 These platforms, that enable simulation of multiple sub-systems across disciplines and domains extend a multi-perspective view of system interaction and are termed as co-simulation systems. In this blog, we aim to provide a brief overview of co-simulation efforts that have been undertaken, highlight an example of such a work, present a proposal for implementing co-simulation at the distribution grid to capture interaction between the business/market layer of the SGAM model and its physical grid layer. We conclude this article by providing insight into current barriers to co-simulation and the future of such a modelling approach. Co-simulation in the field of smart grids serves as an integrated platform for capturing and analyzing not only the interactions between different components but also decisions of stakeholders and their control actions. For implementing a co-simulation platform, it is important to connect individual systems together. As identified in one of the early works on co-simulation by , it is challenging to model hybrid system environments that combine continuous-time based physical models and discrete events based control models. To address this issue, the work of , aims at demonstrating how complex problems in smart grids can be modelled and decomposed into separated subsystems, that can be simulated on open source platforms. This work generates critical insights on how a cyber physical system prototype can be built and which aspects of design need to be considered. Using co-simulation, it is possible to implement the SGAM model comprising multiple layers that interact with each other. In this regard, the work investigated by  presents a framework based on the combination of power systems, artificial intelligence, and communication to enable the simulation and analysis of agents in a smart grid context. Along a similar line of research,  focuses on the interaction of a multitude of prosumers in a social and electrical network using information and communication technological tools. In such a network prosumers are influenced by price-responsive generation and demand schemes that influence their decisions and are capable of responding to system changes. Such a modelling framework enables actor decisions to be propagated across the layers of the SGAM architecture, making it possible to emulate multi-layered complex dynamic model that lends itself useful in the evaluation of policy decision making by regulators. Hence, co-simulation enables the exploration of the interaction amongst energy consumption, production, distribution and transmission, amongst different energy and non-energy infrastructures such as electricity, heat, gas, transportation and communications as well as socio-economic, environmental and technical phenomena. It opens up possibilities for addressing problems and questions that were previously beyond reach, and enable systematic assumption testing. A co-simulation constitutes models, datasets and actors. Models are developed for defining system behavior, datasets specify the input and output streams of information and actors represent the entities that perform the decision making. These objects interact with each other in various forms, such as Model – Model interactions, Model – data interactions, Data – data interactions, Data – actor interactions, Actor – model interactions and Actor – Actor interactions. These different interactions can be implemented using different structures such as centralized, decentralized, tightly connected, loosely connected. Independently, each model provides a partial picture of the components and relationships underlying a given problem. Together, they provide a multi-dimensional, and constantly changing, representation of the system at hand. We now present a co-simulation framework that was developed at the Faculty of Technology, Policy, and Management at the Delft University of Technology. 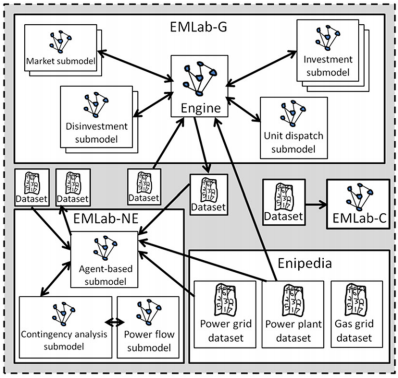 The Energy Modelling Laboratory (EMLab) is a “suite of agent-based models dealing with policy questions on the long-term evaluation of the electricity sector.” It consists of three distinct models: EMLab-Generation, EMLab-Congestion, and EMLab-Network Evaluation. These models have been developed for different purposes and represent different dimensions of the long-term development and operation of Northwest Europe’s electricity transmission infrastructure . EMLab-Generation (EMLab – G) explores the long-term effects of interacting energy and climate policies by representing how power companies invest in generation capacity. 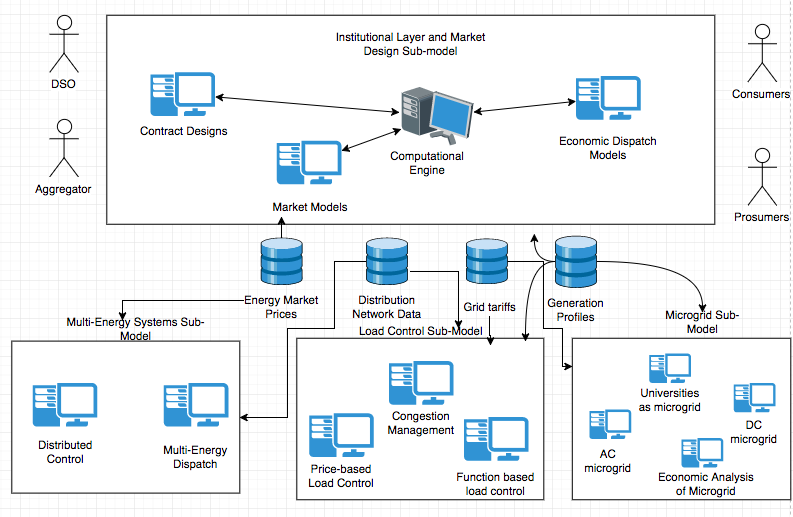 Modules inside the EMLab-G model comprise of market algorithms for representing the electricity spot markets and CO2 auctions, an investment algorithm for representing processes of investment in generation capacity and others. EMLab – G outputs csv files which are then supplied to the EMLab-Network Evolution (EMLab – NE) model. EMLab – NE focuses on the possible development trajectories of the Dutch electricity transmission network and is composed of multiple components. The EMLab – NE model comprises of agent-based submodels developed in Netlogo, and a contingency analysis submodel developed in MATLAB. Further, EMLab comprises of EMLab-Congestion (EMLab – C) that explores the dynamics in an electricity market subject to transmission line congestions. In addition, a data repository, Enipedia, contains information pertaining to the power grid, power plant information and details about the gas networks that feed information to the other modules and thereby facilitate their simulation. Thus it can be observed that a co-simulation framework such as EMLab consists of different models that interact with each other to capture various aspects of electricity transmission along the Northwestern part of Europe. While EMLab focuses on the transmission grid, there are limited such initiatives at the distribution grid level. At the distribution grid it is expected that the penetration of renewable energy systems is to increase significantly. Furthermore, the constituency of loads (for e.g. heat pumps) are expected to move towards electricity consumption based. The issue with the large penetration of renewable energy systems at the distribution grid is explained for e.g. in the study conducted by the California Independent System Operator . DSO – Aggregator coordination: This component of D – EMLab will focus on the coordination between the DSO and the aggregator. The DSO is responsible for the stable and reliable operation of the grid while accounting for voltage control, congestions and losses. In order to assist the DSO in its operation of the distribution grid, the aggregator can provide services to the system operator through services flexibility provision. However, it is important to define the models, the data and the objectives of both the DSO and the aggregator. Hence, this component will focus on addressing how the DSO and aggregators should coordinate at the distribution grid level to address issues of congestion management and voltage control in the low/medium voltage electricity distribution grid. Furthermore, market models at the distribution grid such as the ones proposed by the SmartNet project  and quota based models  that can provide insight on the interaction between DSO and aggregators can also be applied in this model. Load Control: Based on the decisions/control actions determined at the business/market layer, DSOs can request aggregators either for upward/downward flexibility. Furthermore, DSOs could also request aggregators to assist in congestion management thereby deferring the need for grid reinforcement. In order for the aggregator to provide the DSO with flexibility, they would need to engage in load control, which could be accomplished in two ways. Load control can either be achieved through price based load control (such as transactive energy management ) or through functional value (such as state of charge values for electric vehicles or temperature set points for thermostatically controlled loads) based direct load control can be facilitated. Multi-Energy Systems: In urban energy systems, there is a demand for both electrical and thermal energy systems. However, the energy vectors are planned and operated independently. Dall’Anese et. al  in their work identify, that the integrated optimization and control of multi-energy systems is of paramount importance. This is due to the significant socioeconomic, operational efficiency, and environmental benefits they can provide to the planning and operation of the distribution gird. Hence, the focus of this component is for the modelling and development of a multi-domain multi-energy analytical framework that can couple the vectors of thermal and electrical energy in a simulation environment, that enables us to investigate the impact on the different actors associated with the different energy systems. Furthermore, business/market layer can incorporate decision models which need to be made for driving the unified operation across energy vectors. Microgrid Model: In this component, we propose the idea that a microgrid be viewed as the smallest feasible component of the distribution grid that can work either in a grid-connected or an isolated mode. Inside such a unit, it is possible to consider clusters of consumers and prosumers who can either provide demand response services or sell their energy back to the grid to satisfy local energy demand to reduce power consumption from the transmission grid. Furthermore, with the integration of large amount of solar panels and wind farms that are inherently dc current based in addition with the fact that most end-use appliances are dc energy based, we can investigate the application of microgrids that are low voltage direct current based microgrids. Languages: There are a lack of languages that unify the various models together. Different models can be implemented using different modelling languages, and hence it is a challenge to unify the models. Documentation: There is limited knowledge on what methods can be used for documenting, version management and performing collaborative work. Hence, there is a need for determining ways for facilitating collaborative work on co-simulation and tracing complex tasks. Formats: There are a lack of accepted standards regarding time series, parameters, libraries and components. Distributed Computing: The challenge pertains to how we split large systems into smaller modular components and run them simultaneously. Standards like HLA (High Level Architecture) have been implemented successfully but are quite rigid while other attempts at implementing distributed computing lacks standards. Model Heterogeneity: It is difficult to integrate models which are of different types such as combining statistical models, physical models and others in a way that they generate coherent valuable information. Uncertainty propagation: Uncertainties or errors that emerge in one model could either be added up or multiplied when two or more models are coupled. Hence, it becomes a compelling task how to mitigate such uncertainties. Even though co-simulation does face a few challenges, its future is promising. Co-simulation enables a multi-layer complex analysis of smart grids and provides feedback from physical components in almost real-time. To this end, the work of  presents a novel modular distributed infrastructure, based on real-time simulation for multi-purpose smart grid studies. Such a simulation setup, enables one to integrate high amounts of distributed generation technologies such as storage, electric vehicles and ICT technologies for a combined analysis of the system. Building on this,  proposes a real-time multi-site co-simulation framework in which control strategies for the interaction between smart grids and active prosumers in distribution networks can be tested. The additional aspect of multi-site real-time co-simulation is achieved by interconnecting multiple real-time digital simulators located in different laboratories that could potentially be placed at different geographic locations. This enables expanding capabilities of individual laboratories to study large-scale interdisciplinary problems. In addition, it enables technical cooperation between different parties while addressing issues of confidentiality, by limiting the amount of information shared between the decoupled models. The work accomplished in  is extended in  where the attempt is to create a Pan-European distributed laboratory. The integrated distributed laboratory will be capable of facilitating the modelling, testing and assessment of power systems beyond the capacity of a single entity, by providing remote access to software and equipment anywhere in the EU, through real-time interconnections. Through such a distributed laboratory, it will be possible to enable integration of different sub-systems (distribution grid, transmission grid, generation, market, and consumer behavior) and analyze the results with a holistic perspective. Hence, the future and the possibilities that co-simulation can help unlock are promising. M. Stifter, E. Widl, F. Andren, A. Elsheikh, T. Strasser en P. Palensky, „Co-simulation of components, controls and power systems based on open source software,” in IEEE Power and Energy Society General Meeting, 2013. „CEN-CENELEC-ETSI Smart Grid Coordination Group CEN-CENELEC-ETSI Smart Grid Coordination Group Smart Grid Reference Architecture,” 2012. P. Palensky, E. Widl en A. Elsheikh, „Simulating Cyber-Physical Energy Systems: Challenges, Tools and Methods,” IEEE Transactions on Systems, Man, and Cybernetics: Systems, 2014.
 . Ahmad, J. H. Kazmi, M. Shahzad, P. Palensky en W. Gawlik, „Co-simulation framework based on power system, AI and communication tools for evaluating smart grid applications,” in Proceedings of the 2015 IEEE Innovative Smart Grid Technologies - Asia, ISGT ASIA 2015, 2016. Y. Cai, T. Huang, E. Bompard, Y. Cao, S. Member, Y. Li, Y. Cai, Y. Cao, Y. Li, T. Huang en E. Bompard, „Self-Sustainable Community of Electricity Prosumers in the Emerging Distribution System,” IEEE TRANSACTIONS ON SMART GRID, vol. 8, nr. 5, 2017. L.A. Bollinger, I. Nikolic, C.B. Davis, G.P.J Dijkema, “Multimodel Ecologies: Cultivating model ecosystems in industrial ecology”, Journal of Industrial Ecology, 2015. California ISO, "California ISO Duck Curve," 2013. E. Dall'Anese, P. Mancarella en A. Monti, „Unlocking Flexibility: Integrated Optimization and Control of Multienergy Systems,” IEEE Power and Energy Magazine, 2017. H. Gerard, E. Rivero and D. Six, "Basic schemes for TSO-DSO coordination and ancillary services provision," 2016. Nabe, "Smart-Market-Design in deutschen Verteilnetzen," 2017. P. Palensky, A. A. Van Der Meer, C. D. López, A. Joseph en K. Pan, „Applied co-simulation of intelligent power systems: implementation, usage, examples”. E. Bompard, A. Monti, A. Tenconi, A. Estebsari, T. Huang, E. Pons, M. Stevic, S. Vaschetto en S. Vogel, „A multi-site real-time co-simulation platform for the testing of control strategies of distributed storage and V2G in distribution networks,” in 2016 18th European Conference on Power Electronics and Applications, EPE 2016 ECCE Europe, 2016. C. Felix Covrig, G. De Santi, G. Fulli, M. Masera, M. Olariaga Politecnico di Torino, E. Bompard, G. Chicco, A. Estebsari, T. Huang, E. Pons, F. Profumo, A. Tenconi, R. W. De Doncker, M. Grigull, A. Monti, M. Stevic en S. Vogel, „JRC-IET: A network of European labs for a science-based support of policy decision making toward future electricity systems A European Platform for Distributed Real Time Modelling & Simulation of Emerging Electricity Systems”. J. K. Kok, C. J. Warmer and I. G. Kamphuis, "PowerMatcher: Multi Agent Control in the Electricity Infrastructure," in International Conference on Autonomous Agents and Multiagent Systems, 2005.